Toy fans have... mixed feelings about the exclusive figures offered by ToyFare magazine. While a lot of the figures they offer are cool, they're often way, way too hard to get. Of course, that may have a little something to do with ToyWiz.com, a store that always seems to have a healthy supply of the Wizard-exclusive toys on hand, sometimes before they even ship. Think that has anything to do with the fact that (Wizard founder) Gareb Shamus's brother runs the store? Nah, couldn't be. In any case, some of their exclusives are darn clever. To coincide with the debut of DC Direct's Kingdom Come line, they offered an Alex Ross figure of their own - the former sidekick currently known as Arsenal, all grown up and on his own. Former teen sidekick Speedy has grown up since his days of crime-fighting alongside Green Arrow. Taking over his mentor's mantle and calling himself Red Arrow, he joins Superman's crusade in building a utopian world - pitting himself and his fellow ex-Titans against their former teachers, who do not agree with their proteges' black-and-white outlook on the world. Red Arrow was one of the simpler costume updates undertaken by Ross for Kingdom Come - he took the classic Green Arrow costume, designed by comics legend Neal Adams, and colored it red. Thus, "Red" Arrow. In a nice nod to the series, DC Direct did the exact same thing: taking one of their earliest figures - the Silver Age Green Arrow - DC painted it red. It was a quick and easy way to deliver a brand-new character, and one that fit in perfectly with the line. Since Red Arrow is a repaint of a toy from a different sub-series, he's got a lot more articulation than the other KC figures. While they're mainly statues designed to evoke Ross's artwork, Red Arrow moves at the neck, shoulders, elbows, wrists, hips and knees. 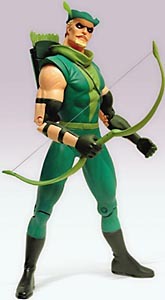 It would have been nice if DC had sprung for balljointed shoulders when they first created this body, since there's no way for this archer to aim his bow. Boxed in the same ToY Award-nominated packaging as the rest of DC Direct's Kingdom Come line, Red Arrow will even integrate well with MOC collections. His only accessory is his bow, and he has a quiver glued to his back. The Red Arrow costume eventually became a part of the fallout from Kingdom Come - whenever one of these "possible future" stories shows up, a wave of changes designed to move characters toward that end appear. In one issue of Teen Titans, the guest-starring Arsenal received a new costume, a red version of Green Arrow's classic outfit. How inventive! It didn't last very long, however, and he was back to being his own man in no time. Red Arrow not only shows that the Kingdom Come figures didn't need to be statues to capture the look of Ross's art, but also shows that clever repaints can make for good figures. How scummy is the blatant nepotism between Wizard and ToyWiz? Tell us on our message board, The Loafing Lounge.